Heading into the All-Star break, Ajavon is averaging 2.2 points in 7.2 minutes per game. While Ajavon has appeared in 17 of 20 games overall, she's not seeing nearly enough minutes warrant consideration in DFS contests. Ajavon is averaging just 7.4 minutes per game over her first 14 appearances this season for the Dream. At this point in her career, the 31-year-old provides most of her value as a mentor to the younger players on the team. With her more productive seasons firmly in the past, Ajavon's role isn't expected to change before the season comes to an end. WNBA TRANSACTIONS: Selected in the first round by the Houston Comets with the No. 5 overall pick in the 2008 WNBA Draft … Selected second overall by the Washington Mystics in the dispersal draft following the 2008 season … Re-signed by the Mystics on March 6, 2012 … Traded to the Atlanta Dream on March 12, 2014 … Re-signed by the Dream on May 6, 2015. 2017 WNBA Season: The veteran played in 31 games and started two for the Dream…Averaged 2.4 points and 1 assist in 8.1 minutes per contest…Recorded six points, five rebounds and four assists in 25 minutes vs. Dallas on Aug. 19…Scored a season-high eight points, going six-of-seven from the free-throw line in win over Dallas on July 9…Finished with eight points in 10 minutes to help the Dream defeat Indiana on July 7. 2016 WNBA Season: Played in 32 games and started two… Averaged 3.3 points and 1.2 assists…Finished with a season-high six assists vs. Mystics on Sept. 15… Passed the 500 career rebound milestone at Connecticut (7/10)… Scored a season-high 12 points on May 20 at Indiana. 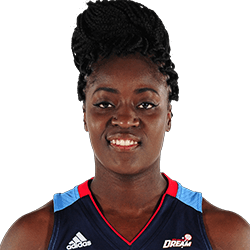 2015 WNBA SEASON: 47 steals was 6th most in the league tied with Epiphanny Prince…Played in 33 games…Season high 21 points at Chicago (7/21)…Season high 7 rebounds (8/28)… Single season career-high 61 defensive rebounds…Career-high 9 assists at Connecticut (8/23). 2014 WNBA SEASON: Played in 24 games, including one start … Had missed just one game in her career prior to missing six straight games from June 7-22 … Averaged 2.2 points, 0.8 rebounds and 0.7 assists … Season-high eight points with three assists and two rebounds Aug. 10 at Chicago. 2013 WNBA SEASON: Played in all 34 games, starting 27 … Averaged 8.9 points and 2.9 assists … Scored in double figures 13 times, including a season-high 20 July 31 vs. New York … had a career-high eight assists Aug. 11 vs. Connecticut. 2012 WNBA SEASON: Played in 33 games, starting 22 … Averaged 7.9 points, 2.0 assists and 1.6 steals per contest … Ranked ninth in the league in steals, and had a career-best seven May 30 at Minnesota … Led team and ranked 17th in the league in free throw percentage (.827). 2011 WNBA SEASON: Ranked second on the team and 11th in the league in scoring with 14.7 points per game … Scored in double figures in all but seven games, including seven games with 20+ points and one with 30+ …Led the Mystics in scoring in eight games and assists in 15 games … Contributed 3.1 assists per game … Finished seventh in the league collecting 1.68 steals per game and set a then-career high with five steals against Phoenix on July 15…Finished 17th in the league in free throw percentage (.829) … Scored her 1,000th career point in a 91-81 win over New York on August 6. 2010 WNBA SEASON: Appeared in every game … Averaged 5.9 points per game in the regular season … Ranked third in the league in steals per 40 minutes (3.06) … Averaged 18.0 points in the post-season in two games, shooting .440 from the field and .750 from the free throw line. 2009 WNBA SEASON: Played in every game … Started in four games … Averaged 8 .0 points per game … Averaged 17.3 minutes per game … Scored a new career high 32 points against the Chicago Sky on Sept. 4…Shot 83.3 percent from the free throw line during her first playoffs appearance. 2008 WNBA SEASON: Played in every game … Averaged 8.0 points and 1.7 assists per game … Scored a then-career high 24 points June 28 against the Indiana Fever … Was ranked in the top ten of numerous rookie categories such as points (7th), assists (7th) and steals (8th). COLLEGE CAREER: Completed her Scarlet Knight career with a 109-32 team record … Earned Honorable Mention All-American honors in 2007 and 2008 … Helped lead her team to four NCAA tournament appearances, including a trip to the 2007 national championship game and two other regional finals appearances … Named to the All-Big East First Team in 2006 and 2008, and was a second-team pick in 2005 and 2007 … Named the Greensboro Regional Most Outstanding Player in 2007 and to the Greensboro Regional All-tournament team in 2008 … Ranks eighth in school history with 1,622 career points, and fourth in assists (556) and steals (275). PERSONAL: Born in Monrovia, Liberia … Daughter of Patience Wilson…Has one brother and two sisters…Enjoys playing ping pong, writing and reading poetry.